On reinforced porous concrete, installed by Melbourne’s premier permeable contractor. Multi-unit sites, commercial developments, car parks and streetscapes. Get a new driveway, with no demolition. Non-slip, natural stone paving with no puddles. Registered Landscaper Builders. New and existing homes, subdivisions, townhouses and commercial landscape construction. Welcome to the New Dawn Permeable Paving website! We are landscape contractors who specialise in permeable paving for all types of applications – both domestic and commercial. Whether you’re looking to have work completed on a new or existing landscape or development, New Dawn has you covered. 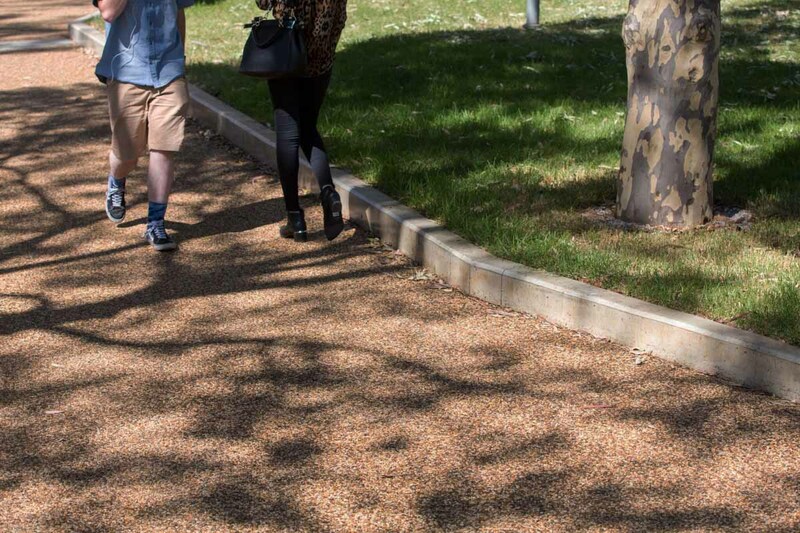 We’re different because we exclusively use ‘Pebble Pave’, a resin-bound aggregate that differs from porous pavers. Unlike traditional permeable pavers, which come in fixed sizes, Pebble Pave is poured on-site, allowing us to do areas in any shape or size. We also install all our new permeable paving on custom reinforced porous concrete, ensuring your paving is strong enough for the intended usage. We specialise in permeable paving, driveway resurfacing, pool surrounds, and landscaping. We hope our website will give you a good overview of us and our permeable pavements, and their common applications. But if you’re not sure what you’re after, or if it can be done – then just give us a call! We’re always happy to chat permeable paving, landscaping and more. or watch us talk about permeable paving below! We’re real people and we care about what we do. Watch us chat about what permeable paving is, how we do it, and our points of difference. Find out more about us and our work by clicking the button below! We are also a Registered Building Practitioner for Structural Landscaping. By using a registered building practitioner, you are using a licensed, insured business whose work is guaranteed and complies with all required building codes and laws.